Rockwell Automation has released patches and mitigations for several potentially serious vulnerabilities discovered by Cisco Talos researchers in its Allen-Bradley MicroLogix 1400 programmable logic controllers (PLCs). According to Cisco Talos, the vulnerabilities can be exploited for denial-of-service (DoS) attacks, modifying a device’s configuration and ladder logic, and writing or removing data on its memory module. 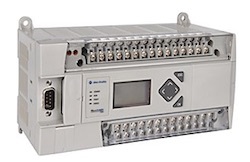 Since these controllers are typically used in industrial environments, including in critical infrastructure organizations, exploitation of the flaws could result in significant damage, Talos said. The most serious of the flaws, based on their CVSS score of 10, are a series of access control issues that have been assigned a dozen CVE identifiers. A remote and unauthenticated attacker can exploit these vulnerabilities to obtain sensitive information, modify a device’s settings, or change its ladder logic – all by sending specially crafted packets. While exploiting many of these flaws requires that the controller’s keyswitch is in REMOTE or PROG position, reading the master password and the master ladder logic works regardless of the keyswitch setting. Another potentially serious flaw is CVE-2017-12088, which allows a remote attacker to cause the controller to enter a fault state and potentially delete ladder logic by sending specially crafted packets to the Ethernet port. DoS vulnerabilities also exist in the device’s program download and firmware update functionality, but these have been assigned only a “medium severity” rating. Other issues considered less serious include a file-write vulnerability affecting a memory module, and a DoS flaw related to the session connection functionality. While a CVE identifier has been assigned to the session communication bug, Rockwell says the system actually works as intended and no patches or mitigations are required. Rockwell Automation has released firmware updates that address some of these flaws. The company has also proposed a series of mitigations that include migrating to more recent series of the MicroLogix 1400 controller, setting the keyswitch to “Hard Run” to prevent unauthorized changes to the device, and disabling impacted services. Cisco has published technical details and proof-of-concept (PoC) code for each of the vulnerabilities. Rockwell Automation has also released an advisory, but it can only be accessed by registered users. This is not the first time Cisco Talos researchers have found vulnerabilities in MicroLogix 1400 PLCs. In 2016, they reported discovering a weakness that could have been exploited to modify the firmware on these devices.